We’ve mixed it with OJ, hidden it in flasks, refilled parents’ bottles with water. But where did vodka come from? Take a good look at the vodka section of your local liquor store. On the upper shelves you’ll find shimmering glass bottles of all shapes and sizes originating from every corner of the world. 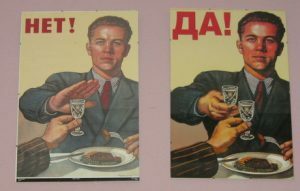 Vodka today is the world’s most popular liquor and a true global commodity. Looking below the so-called top shelf import and boutique vodkas you’ll see cheap, domestic products, their plastic bottles usually emblazoned with Russian symbols, often bearing the name of the Russian entrepreneur who fled the Bolshevik Revolution to set up shop in the West. Without a doubt, vodka is the definitive Russian cultural product. But what is vodka? Where does it come from, and why do the Russians seem to have a particular affinity for it? In 2006 I went to Russia to find answers—and if you go to Russia today with such questions, you’ll invariably end up in the same place I did: the Vodka History Museum at Izmailovsky Park in northeast Moscow. In the tumultuous 1990s, Izmailovsky Park was a bustling souvenir bazaar and open-air flea market. Today, the rickety stalls of the souvenir peddlers have been updated with colorful, sturdy veneers, while happily towering over the market is a bright, Disneyfied kremlin housing the Vodka Museum. I highly recommend a visit: after perusing the museum’s artifacts you can knock back complimentary vodka samples in their recreated nineteenth-century tavern with windows festooned with gilded decorations and wooden tables bracketed by long, sturdy benches of dark mahogany. Apparently caught off guard by the directness of my questions, she hesitated momentarily before pulling out a well-thumbed paperback of a book I knew only too well: Istoriya vodki (A History of Vodka) by Vilyam Vasilevich Pokhlebkin—the bible of Russian vodka history. I’ll admit that I only feigned interest as the guide proclaimed how the illustrious historian Pokhlebkin unquestionably proved that vodka as we know it was first made inside the Moscow Kremlin, sometime between 1448 and 1478. Though disappointed, I politely thanked the hostess for her time and left without ever getting to the free samples.